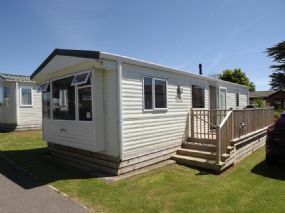 Our luxury family & dog friendly caravans, SeaSnug, is situated within the quiet and peaceful dog friendly Perran Sands Caravan Park, Perranporth in Cornwall. Sea Snug is a five berth caravan which is fully central heated. It has an enclosed outside decking and seating. There is a parking space for one car outside the caravan. Beaches, surfing, and breathtaking countryside – that’s what our Perran Sands Holiday Park is all about. Whether you prefer to sit back and take in the stunning views, or you’re looking for a new activity to try, you’ll be spoilt for choice here. With both indoor and outdoor swimming pools, a surf school right on the beach where you can have a go at watersports such as surfing and paddle boarding, and an Activity Hub packed full of fun and games there’s lots to keep you busy! If relaxing with your dog is more your idea of fun, why not take some time for yourself on the beautiful beach, explore the surrounding area with a coast walk or simply settle back and watch the world go by as you enjoy a delicious scone and cream tea? Surf Bay Café serving delicious meals with regionally sourced ingredients, and Cornish cream teas.